5dimes opened their sportsbook back in 1991 as a classic post-up operation. Unlike pay per head services, individual gamblers deposit money directly with 5dimes who then adds or deducts money from the players account based on wins and losses. Post-up operations like this typically offer large cash bonuses or free plays in order to attract clients in the extremely competitive post-up sportsbook industry. For this reason alone local bookies should avoid them as their players may be enticed to jump ship and start giving their money directly to 5dimes in order to receive these bonuses. 5dimes recently jumped into pay per head service when it started to become more accessible to bookmakers and looked like a profitable venture for them. They have a “take it or leave it” approach to PPH which shows in their high pricing. By trying to be all things to all people they end up doing nothing well. It is obvious that their post-up division is far and away their most important concern with their pay per head division simply serving them as a revenue generator from anyone foolish enough to pay their exorbitant price. Don’t be tempted to put your players in with 5dimes as they are simply a post-up sportsbook posing as a pay per head service. 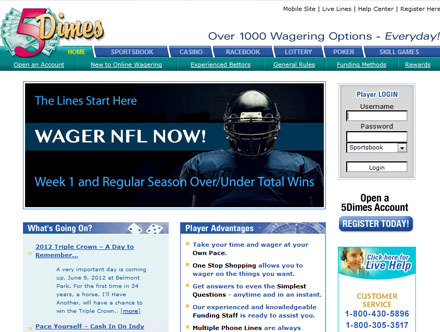 Bookies should only put their players in with companies that are truly dedicated to providing wager outsourcing service.